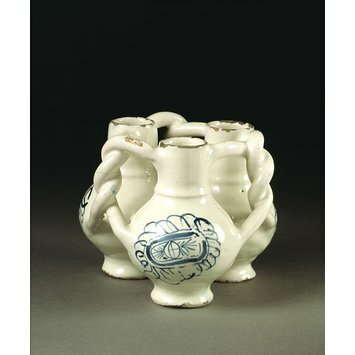 This was one of the more common 'joke' drinking pots of the 17th and 18th centuries. It was known as a 'fuddling cup', meaning that it would confuse or stupefy the user, even though the three interlinked cups would hardly contain enough ale to induce drunkenness. Deltfware is a tin-glazed earthenware. Since the soft earthenware has to be quite thick, and the glaze has to be applied liberally, this small object has a rather coarse appearance. The painted symbols, freely borrowed from Chinese porcelain, are at odds with its lumpish form. Trick beer vessels are usually associated with taverns. However, the fact that this piece has survived in remarkable condition suggests that it was either very seldom used, or else kept at home as a display object. The term fuddling cup is used of a number of small cups or miniature vase-like containers which are joined to each other and have internal apertures and intertwined handles. 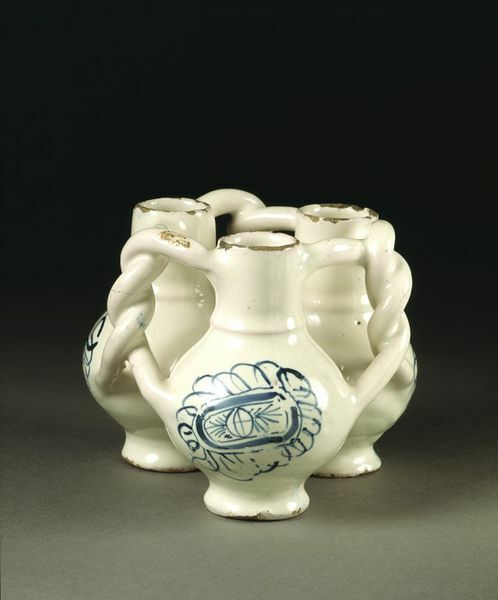 Delftware examples have three or four containers between which liquid can flow freely. Fuddling cup, tin-glazed earthenware, decorated with an oriental emblem, London (probably Southwark), ca. 1630-1640.